Our foundation supports organizations primarily in Harris County, Texas and Monterey County, California. Our founder and board chairman, Frank Hevrdejs, lives in Houston, Texas and his daughter and foundation president, Gabrielle Wagner, lives in Monterey County, California. Supporting local communities where the foundation can get to know the organizations supported has been a focal point of our foundation since inception. 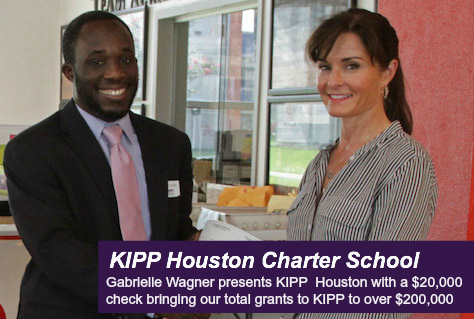 KIPP is a charter school that started in Houston 20 years ago and now has over 58,000 students country wide. Students commit to the KIPP code of conduct and go to school for eight hours/day. Their results are really impressive with KIPP high school graduates having a 5 times higher rate of graduating from college than regular public schools.